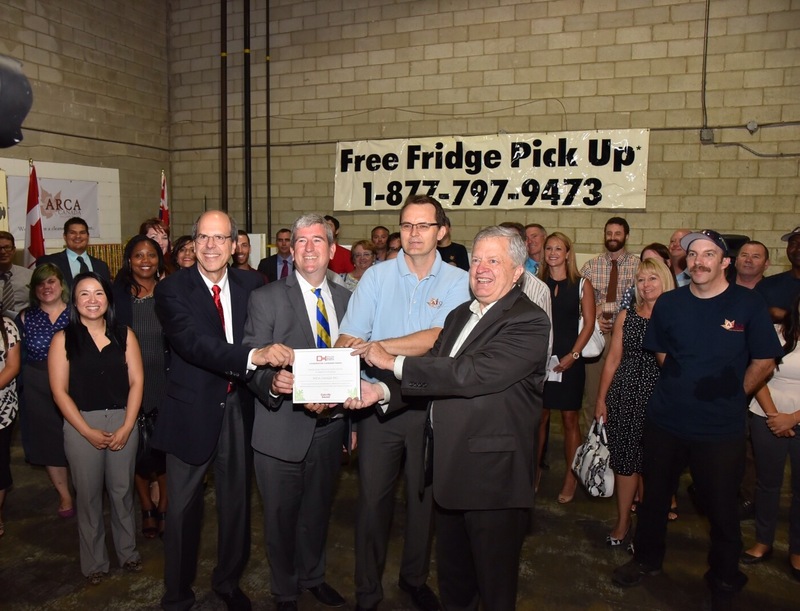 (Oakville, ON, July 31, 2015) Today, Minister of the Environment and Climate Change, Glen Murray, toured ARCA Canada to see firsthand how 500,000 fridges, freezers and other refrigerant-containing appliances have been safely decommissioned since 2006 by ARCA Canada. The environmental implications of this milestone are significant. Without responsible recycling, mercury switches, Polychlorinated Biphenyls (PCBs) capacitors and over 30,000 kg of ozone-depleting Chlorofluorocarbon-based (CFCs), 8,800 kg of Hydrochlorofluorocarbon-based (HCFC) and 1,800 kg Hydrofluorocarbon-based (HFC) refrigerants (R12, R22 and R134a) would have been released into the atmosphere. In addition to the refrigerants, 26,000,000 kg of metals and 900,000 kg of plastics have been recycled. Of special interest to the Minister, was how the facility captures older refrigerants (R12, R22, and R134a), which have significant climate change implications if released into the atmosphere. Tour of ARCA Canada’s refrigerator and freezer recycling plant. The US Environmental Protection Agency (EPA) calculates that 1,000 properly decommissioned fridges, results in the same greenhouse gas emission reductions as removing 1,500 cars from the roads for a year. The IESO is continuing the program until December 31, 2015. The program is free-of-charge and makes it easy for all Ontarians to dispose of old, energy-inefficient appliances. Any Ontarian wanting to ensure that their older fridge or freezer is decommissioned in a safe and responsible way should call their Local Distribution Company (LDC) or go to the saveONenergy FRIDGE & FREEZER PICKUP webpage for program details. High quality images of the event are available. See backgrounder and infographic for more technical details. ARCA Canada Inc. has in-depth experience and professional expertise in providing services to turnkey appliance recycling programs for utilities and other entities concerned with the disposal of appliances containing refrigerants in a manner that meets or exceeds existing provincial regulations and industry expectations. Since 2006, ARCA Canada has set the standard for providing large-scale appliance management services, including managing a call centre, appliance pickup, appliance decommissioning, incentive fulfillment and data management, along with reporting functions.